Finally getting round to finishing my tutorial on Faces. Try to keep the paint thin. I add about 1/2 drop of water to a full drop of well-shaken paint. For all face-painting, I use a 10 year old 'Windsor Series 7' 000 along with my cheap dollar store 3.50x mag reading glasses. Step I. I start by selecting a white-primed figure that has been block-painted and let dry overnight (if you are in a hurry, into the oven for about 15 minutes at 150-170 degrees Fahrenheit). 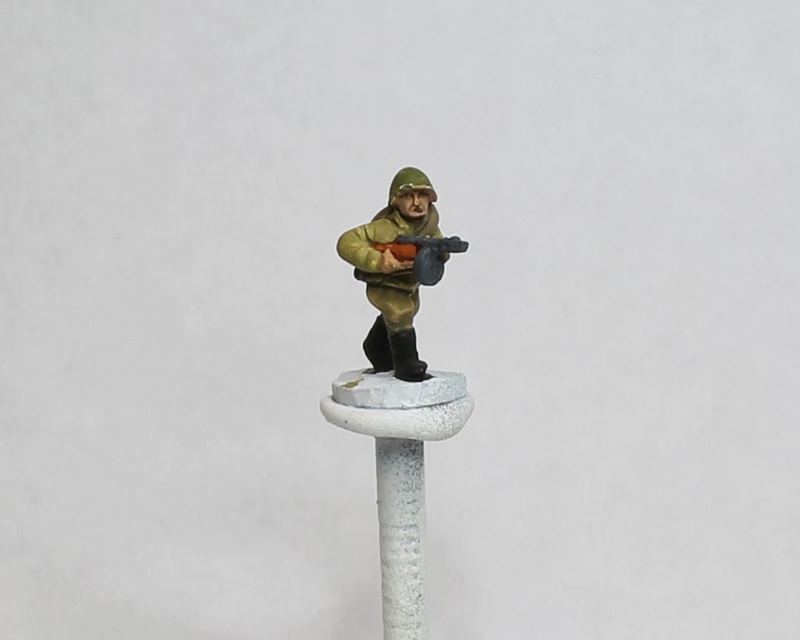 I begin painting an undercoat of Brown Sand on the face and hands. This figure looks pretty beat-up and has a few flaws in the casting (bent nose, no eye on right, and messed up helmet) but will be a good example to work with as you will run into problems and have to compensate by creative painting and re-carving detail (in extreme cases). Step II. 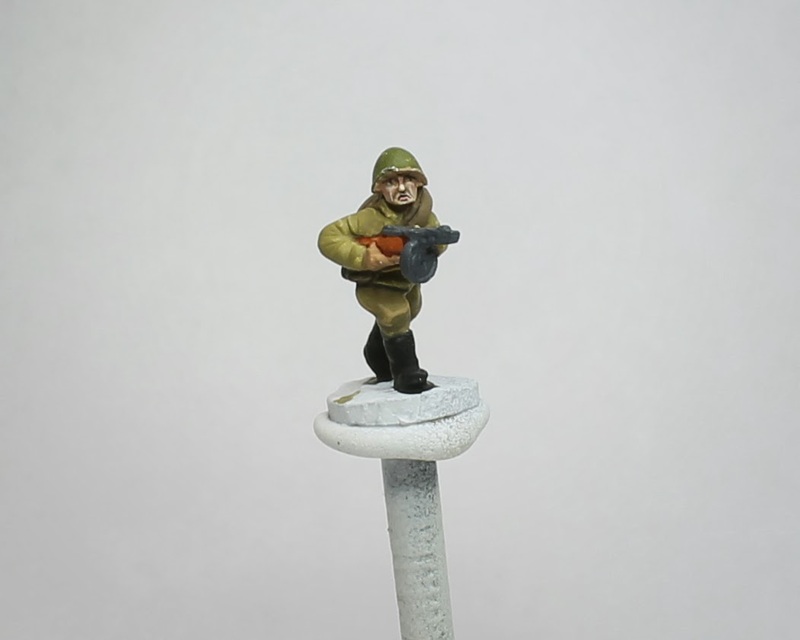 Using German Camo Black Brown, I then add in the eyebrows and a small underline shadow to the underside of the nose. 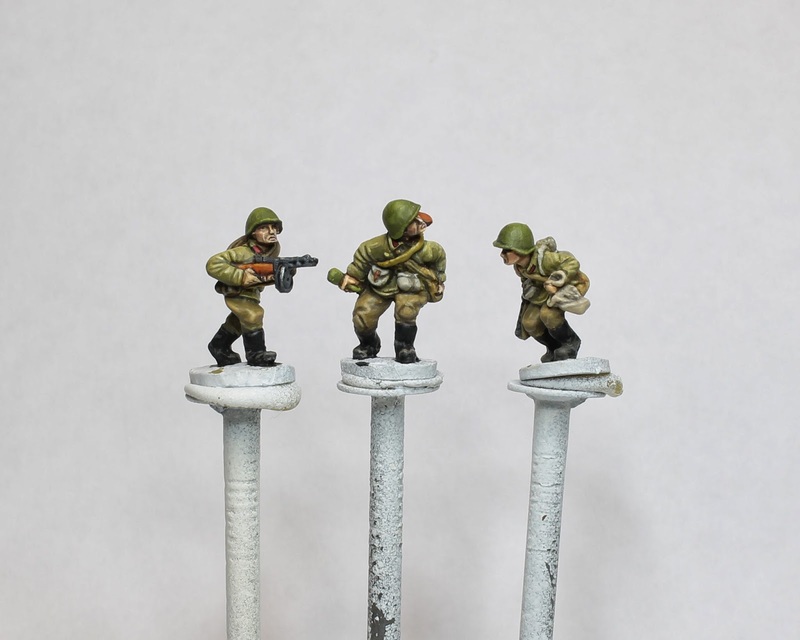 When painting detail this small, make sure you are not low on blood sugar or your hands will shake and it doesn't hurt to have some Tantric breathing exercise techniques in your toolbox! I find I actually do slow my breathing when painting faces. The right eye socket on this figure is in a bit of a cast crease so was a challenge! Step III. 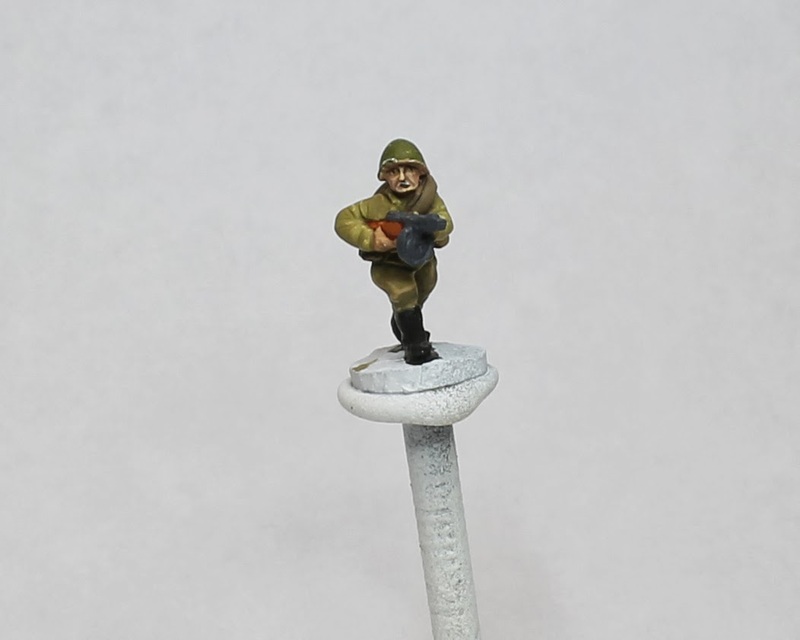 Again using German Camo Black Brown, I then add in a vertical line for the eye in the middle of the eyebrow and paint the lips basic shape. Don't worry if your eyes are too long or big, just try to keep them equal distant relative to each other or your mini will look cross or bug-eyed. 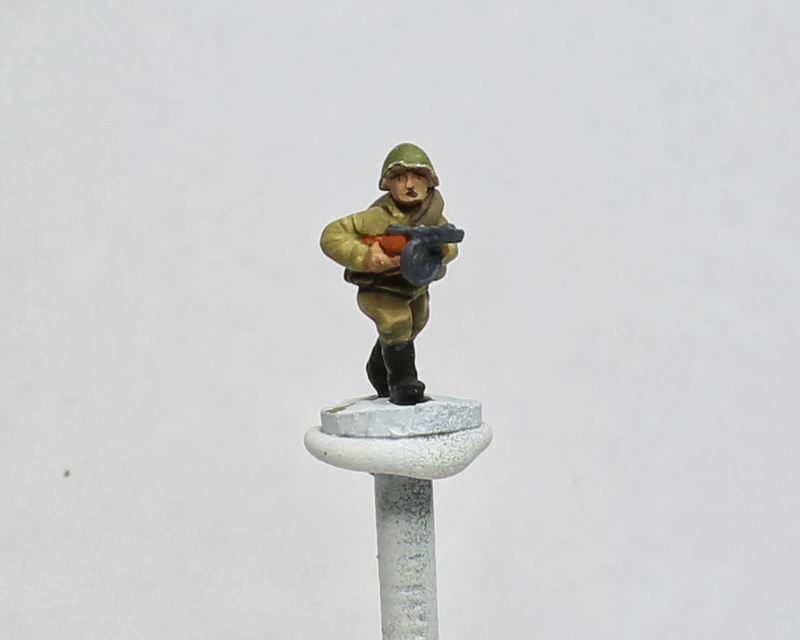 Battlefronts figures made by Even Allen usually have a good representation of the mouth but you can paint in whats not there for the poorer casts. 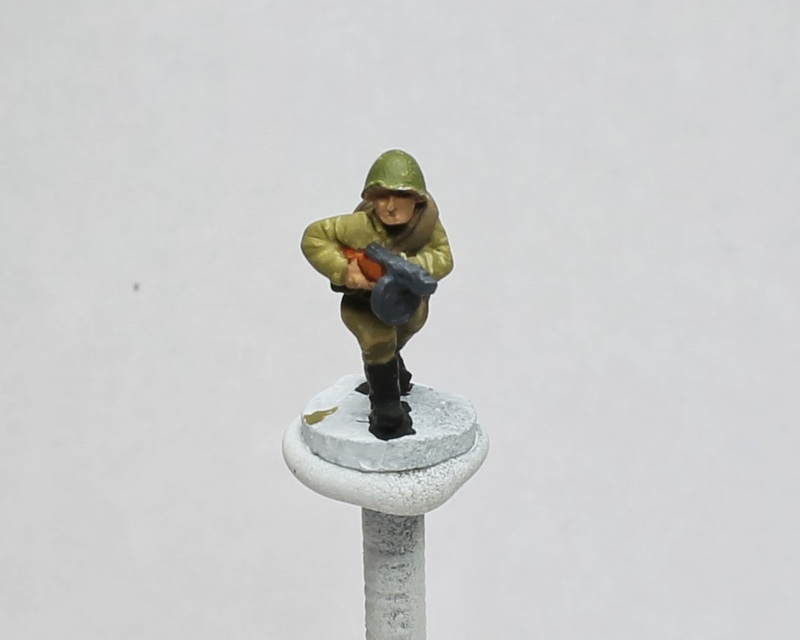 Step V. Using Flat Flesh, mix in a little Scarlet and wet this out to a wash consistency. Not too Scarlet or it will look like clown makeup! Add this to the upper cheek area and follow the line of the mouth crease. Also paint in above the tip of the nose. Step VI. Take Sunny Skin Tone and hit the highlights on the top of the nose, the bottom of the chin, the top of the cheekbones, the edges around the mouth crease, the jaw, and most importantly, the top lip. Connect the top lip to the edge of the jaw by highlighting the edge under the mouth creases. If adding a 5 o'clock shadow, at this stage, mix in an itty bit of Black with Flat Flesh and thin to a wash. Add to the upper lip, chin and jaw-line. Step VII. Using Brown Rose, paint in the lower lip, making sure to leave a small shadow underneath and on the outer edges. Don't paint the top lip, it only shows as a highlight and shadow. If you paint it in, your figure will look like it's got a lipstick obsession. Step VIII. Using Highlights Flesh (or add white to your flesh - sooo damn lazy) hit the extreme highlights, the tip of the chin and nose, upper cheekbones and the upper lip. At this stage, I took my x-acto and smoothed the helmet brim as it was dented. Step IX. Dot in the ear locations with Flat Flesh. Add a shadow under them with Brown Sand. 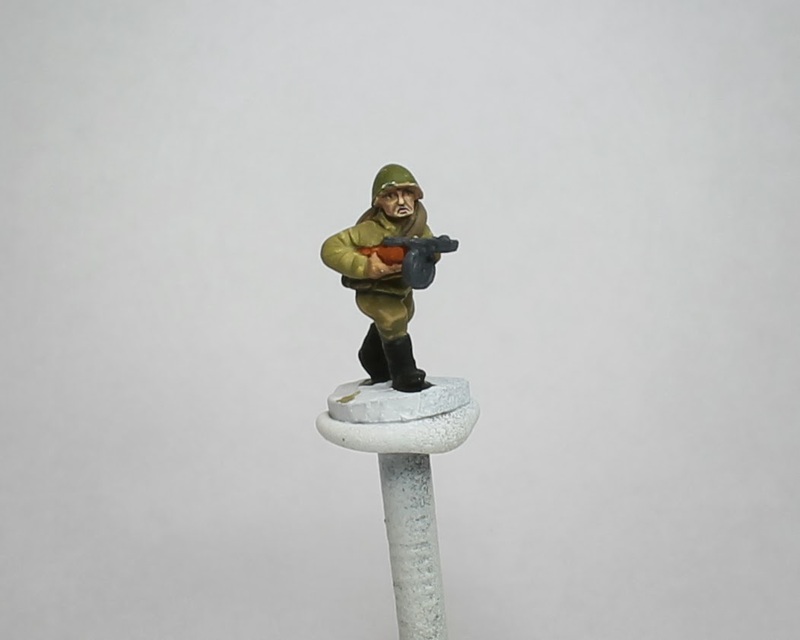 Using German Camo Black Brown, paint in the shadow under the helmet and cut down the shape of the face. This step can be a bit tricky but try to leave a thin line of flesh above the eyebrows. Step X. Now is the time to re-evaluate your painting. clean up any mistakes and reduce the eye size if needed. A good job can be ruined with bug-eyes. I cut down the eyes a bit using Flat Flesh. This fellows face took about 5 minutes of face painting and 2 hours of photos! With practice, you can get similar results. 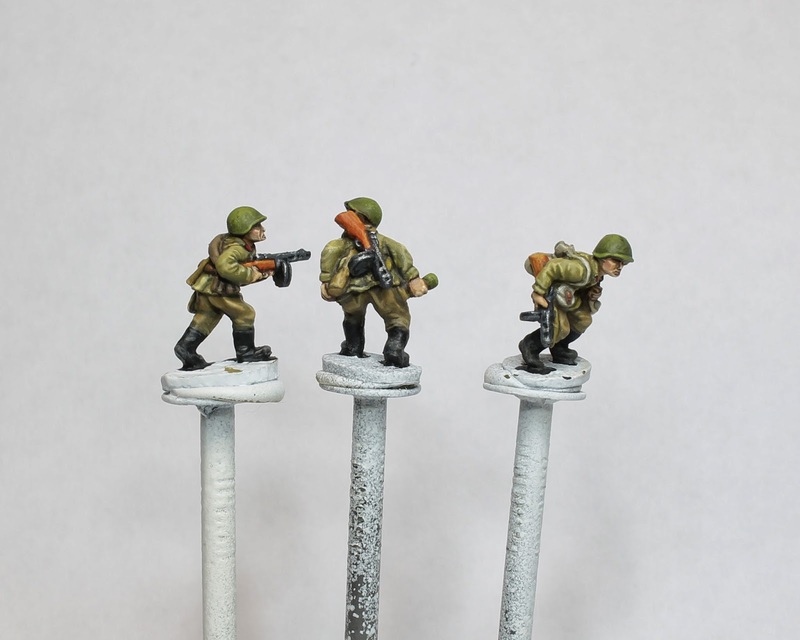 Finished figures, flatcoated with Vallejo Matte Varnish 26.518. I re-shaped the left figures nose as it was too long. 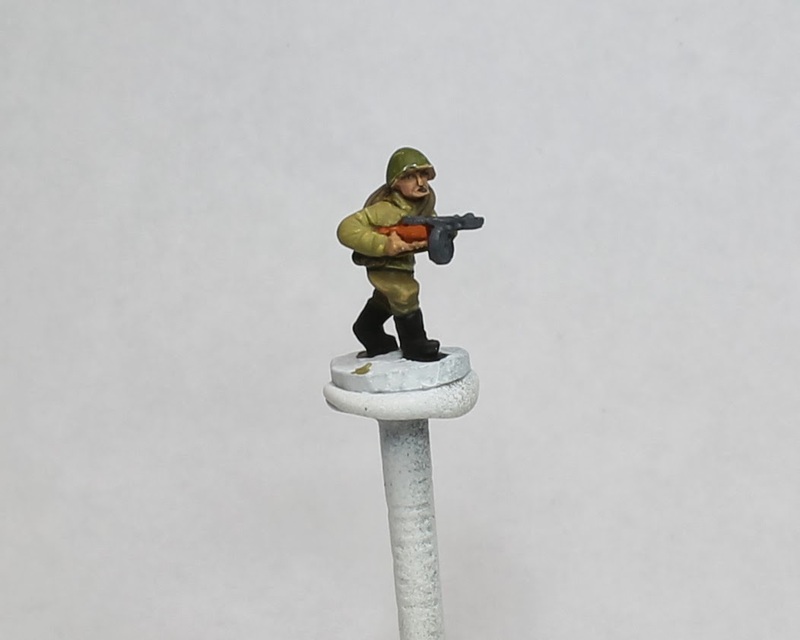 These автоматчики will be part of my Stalingrad-era Guards SMG teams. BTW, click on some of my ads, the wife thinks it BS that I will get paid, I'm starting to believe her! Thanks for posting this tutorial. Your faces look great. 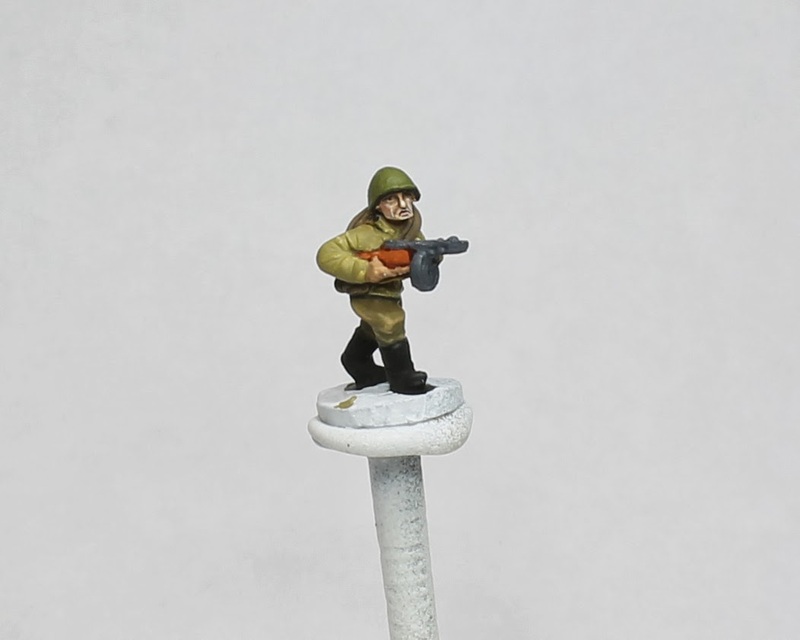 You are making me reconsider how I paint faces. Interesting to hear about painting around casting flaws. 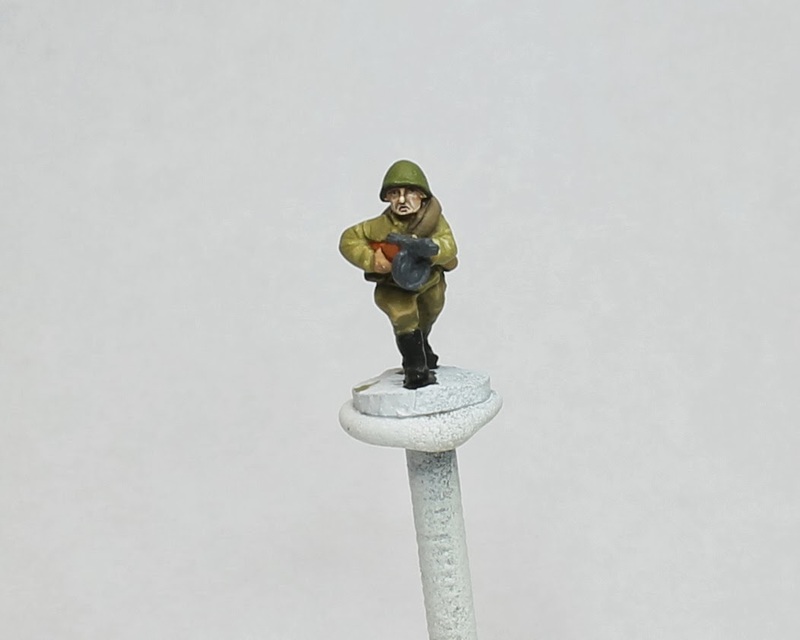 I find it quite frustrating discovering misshapen faces on models as I am painting them. 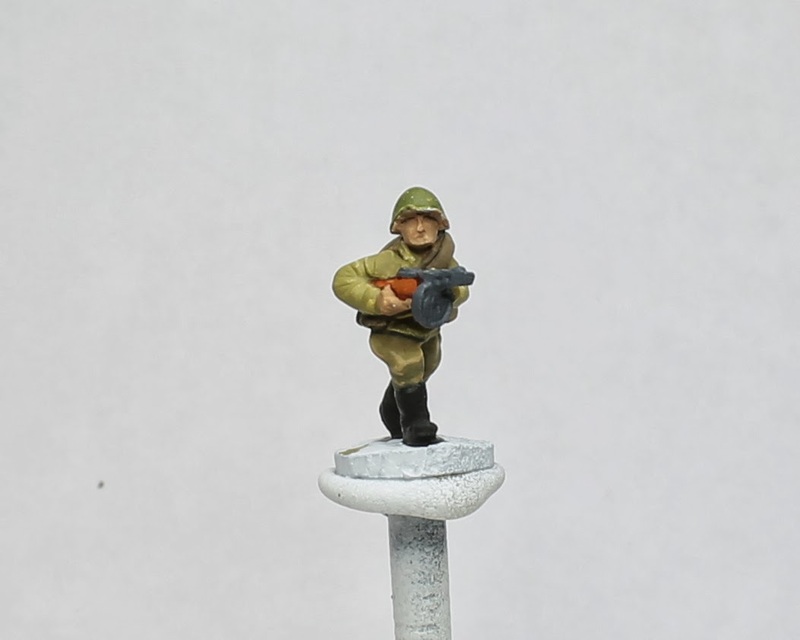 For my German list I am planning to use all the new Battlefront plastic figures to get more consistency in the faces. 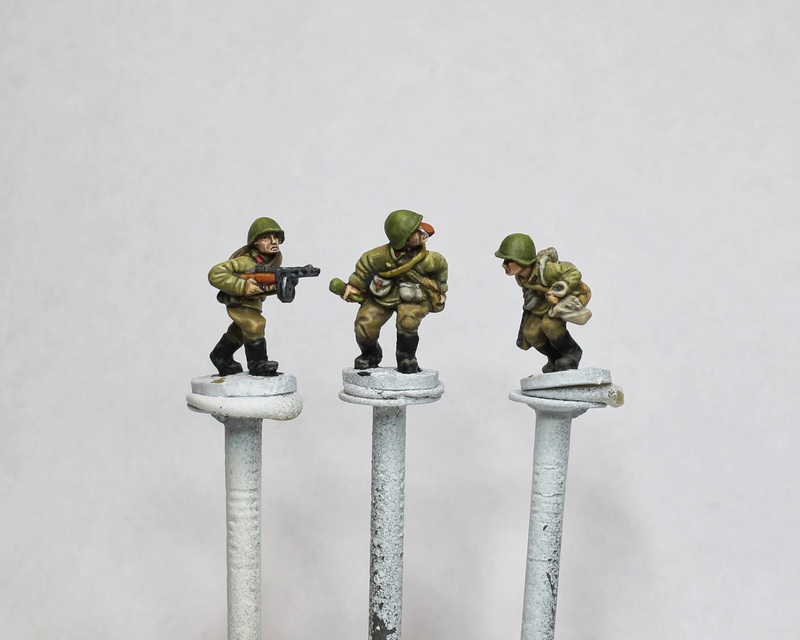 Fantastic tutorial Troy, your faces are easily the best in 15mm that I've seen anywhere. Wow, this is impressive to say the least. 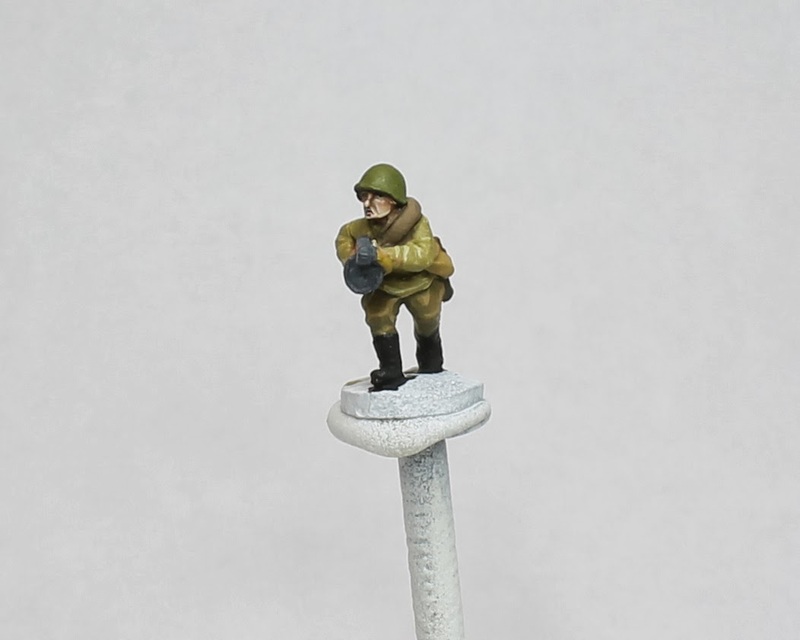 I'll try this out with my upcoming 8th army brits. Brilliant, thanks for sharing your techniques and palette. All of your figures look top notch. I have found that one of the joys of this hobby is that people are willing to put in the time to photograph and share their methods. 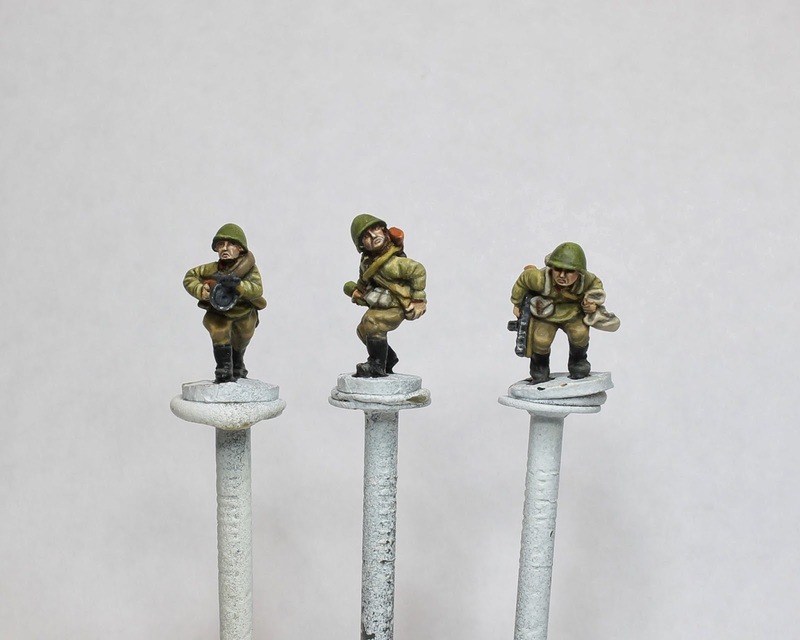 Awesome job - going to have to try the wet palette, I lose a lot of paint to drying on the dry palette. Do you have a tutorial for the rest of the figure as well??? I can barely see the figure let alone do this !